The motto of the City of Detroit dates back to 1805, when a great fire burned nearly the entire city to the ground. Father Gabriel Richard, a French Roman Catholic priest who had moved to Detroit in 1798, wrote these words in the hope that the city would rebuild. It reflected the deep sense of spirit and commitment to the people of the city, which resolved into moving forward and starting anew. In the 210 years since, Detroit has undergone a tumultuous rise and decline. After peaking at the height of the auto industry in the 1960s, the city has struggled with shrinking population and financial resources. Today over 50,000 buildings stand vacant - about 1 out of every 5 buildings in the city. Some have been empty for over 10 or 20 years, as the city lacks the money to demolish them in a timely manner. These vacant buildings, unwatched and unsecured, breed crime, vice, and most devastating of all - fire. For over 155 years, the Detroit Fire Department has stood watch over the city of Detroit and its residents. On an average night, the men and women of the Detroit Fire Department respond to anywhere between 5 and 15 structure fires. There are few jobs so demanding as being a firefighter in Detroit. It is a dirty, wet, exhausting job, with long hours of fighting fires in buildings ranging from small houses to giant factories, each with its hazards and dangers. Why does Detroit have so many fires? What causes them? What are the consequences of fires on the fabric of the city? Starting in September of 2014, Loveland Technologies began tracking all structure damaging fires as part of an effort to to quantify the causes of fires and their impact on residents, structures, neighborhoods, and the city. The goal of this report is to clearly and accurately visualize the impact of fires in Detroit, using data collected from January 1st to December 31st, 2015 by recording and transcribing fire radio audio. Loveland surveyors then visited every fire scene in person within a few days of the fire, photographing each fire and collecting information from residents and neighbors. This deep dive into the data underlying the fire situation in the city gave us a unique perspective to observe how policy changes in the fire department and the city began to impact the fire situation over the course of the year. The city's Hardest Hit Fund demolition program removed thousands of vacant and dangerous buildings, resulting in lower fire rates in HHF program neighborhoods compared to the citywide average. Repairs to broken fire hydrants over the summer and fall of 2015 tracked with a decline in the severity of fires. New leadership at the fire department and additional resources, including replacing ten aging fire engines in the busiest parts of the city and reopening closed stations have had the cumulative impact of slowing the fire epidemic. Substantial challenges still remain: the tax foreclosure and eviction cycle will add to the backlog of houses that need demolition. To keep response times low, further replacements in the city's fleet of fire engines will be needed. This report looks at one year of fires in the city, a year of transition, of setbacks and improvements. The fire situation in Detroit is still dire. In 2016, the city will face thousands of more fires, with wide-ranging consequences detailed in this report. But it is our hope and belief that a corner has been turned. There were 2,981 Structure Damaging fires in 2015. 91% of structure fires happened in residential buildings, including houses, townhomes, and apartment buildings. 8% were fires in commercial buildings, while 1% were in other structures such as churches and schools. 48% of structures were vacant at the time of the fire, with 46% of those occupied. 6% had unknown occupancy. Determining the cause of a fire is difficult. The city's open data portal no longer reports fire causes, so we use the disposition code given by firefighters on the scene to determine the origin. Further investigation may result in the cause changing, but this information is not publicly available. Based on the information given by the firefighters as reported at the scene, at least 53% of fires were either suspicious in nature or confirmed arson fires. 15% had "unknown" as the cause. Other leading causes included fires spreading to multiple structures and electrical fires. There are especially high concentrations of fires in specific parts of the city, as visualized in the map below. Distribution of fires throughout the City of Detroit in 2015. There were 2,716 residential structure fires in Detroit in 2015. 83% of residential fires were in single-family homes. 12% were in multi-family homes, with one to three units. 5% of fires were in apartment buildings that had more than 4 units. Occupancy of the residential structures was nearly evenly split, with 47% being occupied and 47% being vacant. 6% of the homes had unclear occupancy before the fire, including possible squatters and recently vacated homes. The severity of damage played a major factor in whether the house was able to be repaired or occupied after the fire. Houses with major damage or structural collapse were most likely to be abandoned after a fire. 744 houses that burned in 2015 were foreclosed on in 2014 or 2015. Structures foreclosed on by Wayne County in 2014 or 2015 burned at a disproportionately higher rate in 2015 than other houses in the city. Some of these fires were set by tenants after they were evicted or departed. While only 33% of fires in occupied homes not facing foreclosure were suspicious, 41% of similar fires in foreclosed homes were suspicious. Vacant, foreclosed homes have an especially high arson rate. 73% of vacated foreclosed homes had fires that were suspicious in nature. The map below shows high concentrations of fires in neighborhoods experiencing a significant number of foreclosures. Distribution of foreclosed house fires throughout the City of Detroit in 2015. 449 structures that burned were owned by the Detroit Land Bank Authority. After foreclosure, building ownership is transferred over to the Detroit Land Bank Authority. Fires in Land Bank Owned Properties will cost an estimated $4.1 million to demolish. At an average cost of $13,774, demolishing houses damaged by fire will cost over $4 million. Sometimes a fire that starts in one structure spreads to another, due to the intensity of the fire or the close proximity of structures to one another. We call these "exposure" or extension fires, as the fire extends from one building to the next. Our research found that at least 207 fires, mostly residential, spread from one building to another. At least 67 of these fires were severe enough that they spread to two or more buildings. Fires that started in vacant homes spread to adjacent occupied homes, causing significant damage. 22 fires were in properties owned by Wayne County or the Detroit Land Bank Authority. The severity of damage caused by exposure fires began to decrease over the last three months of the year as broken hydrants were repaired and the number of engines responding to fires increased from two to three. Distribution of exposure fires throughout the City of Detroit in 2015. To determine if a fire was suspicious in nature or arson, we used the disposition codes given by firefighters at the scene. 50% of fires have disposition codes of 021, or "suspicious." 3% of fires were disposition 011, or "incendiary." "The release of 'Cause of Ignition' information may aid in the performance of criminal activity and may jeopardize certain facets of investigations performed by the Detroit Fire Department Arson Investigators. Accordingly, the column has been removed." Distribution of suspicious fires in the City of Detroit in 2015 based on disposition code. Detroit fire investigators on the scene of a fire. The Fire Investigation Division’s task is investigating fires in the City of Detroit. Arson investigators respond to suspicious fires 24 hours a day, seven days a week. The investigators, part of a joint unit located under the Detroit Fire Department and Detroit Police Department, focus on identifying the cause of fires and conducting criminal investigations into the fires. Over the course of 2015, the Fire Investigation Division investigated 1,585 incidents, including structures, garages, vehicles, and other types of fires. 256 STRUCTURES HAD MORE THAN ONE FIRE OVER THE COURSE OF THE YEAR. Many structures burned more than once in 2015. Our survey found that 67% of initial fires were suspicious in nature, 14% higher than the overall arson rate. The leading cause of additional fires was arson, followed closely by "rekindles." Rekindles occur when a previously extinguished fire reignites. Most rekindles are minor in nature, and are quickly extinguished. The survey only covered rekindles that were severe enough to cause additional damage to the structure. A fire in a warehouse continues to smolder several days after the fire was put out. Fire has long-ranging impact on the City of Detroit. Fire has become an everyday part of life in some parts of Detroit. The large number of vacant homes in occupied neighborhoods makes fire a constant threat to the residents that live nearby. The cost of fires extends beyond simply putting out the fire: thousands of lives are directly impacted by fire every year, and millions of dollars will be needed to demolish fire-damaged structures. by fire in 2015 when their houses were damaged beyond repair. Another 872 residents were possibly displaced by fire in 2015. Residents lose most of their possessions in a fire. Property loss costs millions of dollars, but the emotional and social costs that go along with displacement and lost are incalculable. It is not known how many people moved to other homes after a fire or left the city altogether. Houses classified with "major" or "collapsed" damage will likely require demolition. Based on these numbers, demolition of houses damaged by fire in 2015 will cost millions of dollars. were damaged badly enough that they wil require demolition. will require demolition unless they are immediately repaired. Structures with fire damage of moderate and collapsed that will likely require demolition in the near future. Fire has a devastating impact on the neighborhoods of the City of Detroit. Between January 1st and December 31st, 2015, 2,981 fires broke out in structures across the city. Including fires that spread to other buildings, 2,669 structures were damaged in some way by fire. Residential structures, particularly single family dwellings made up the majority of buildings that burned. Over half of all structures were vacant or had unknown occupancy. Damage severity ranged from minor to collapsed, with 1,328 causing major damage or collapse. 207 additional fires were caused by fires spreading from one building to another. Arson was the leading cause of fires in the city, with 53% of fires being suspicious in nature or confirmed arson. 68% of suspicious / arson fires were in vacant structures, and caused a significantly higher level of damage than fires with other causes. 744 residential structures that caught fire went through foreclosure in 2014 or 2015. Arson rates in vacant foreclosed houses were significantly higher than the city-wide rate, 63% of which were suspicious / arson. 397, or 55% of fires were severe enough to render the house unsalvageable. New leadership at the fire department and additional resources, including demolishing thousands of vacant homes, replacing ten aging fire engines in the busiest parts of the city and reopening closed stations have had the cumulative impact of slowing the fire epidemic, though there remains more work to be done. This study consists of three components: data collection, verification, and analysis. We collect data by recording the digital radio channels used by the Detroit Fire Department to dispatch and direct fire operations with a Uniden BCD536HP digital trunking scanner, which records fire audio to a memory card. A reviewer downloads the audio files and listens to them in sequence on a computer, transcribing the incidents into a spreadsheet with columns for all pertinent data points. The reviewer determines if the fire potentially caused damage to the structure and if so, adds it to the spreadsheet. What we do track: Fires that cause tangible damage to a structure that requires repair. What we don’t track: False alarms, medical calls, minor fires with no damage such as dryer fires or burning food, or garbage fires outside of a structure. 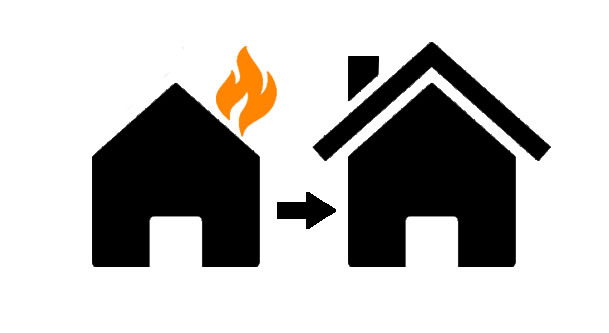 We do not track automobile or garage fires unless the fire spreads and causes damage to the primary structure. One complication is that often a fire in one building spreads to and damages adjacent buildings. if a house fire spreads to the structure next door, how should we count those? Only one fire occurred, but two buildings are damaged. A fire event is a fire that breaks out in a structure and causes damage. Fire events can cause multiple structures to be damaged, but they all share a root cause. 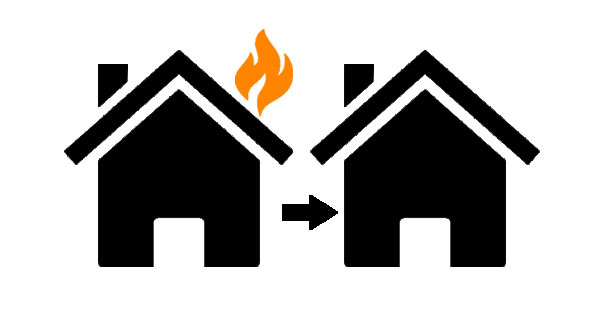 Structure-damaging fires are a subset of fire events. This category covers every building that is damaged by a fire, whether it is an individual fire or caused by adjacent fires (known as exposure or extension fires). A fire at 5263 Proctor Street on August 1st, 2015 was severe enough that it spread to two adjacent houses, destroying them, and caused minor damage to four houses directly across the street. If we count just the original fire, we understate the severity of damage caused by the fire. If we count all seven houses as separate fires, it overstates the number of fire set, as seven individual fires did not occur. For this situation we would classify the fire at 5263 Proctor as a fire event, with six additional structure-damaging fires. After the release of the midyear fire report, we made some minor changes to the methodology of our survey. The primary change was that we began verifying in person fires that caused little or no damage. In cases where we could not find any damage, these were noted as Damage: None. Some data from the previous report is corrected and updated accordingly. The methodology of Loveland's data collection efforts and what we tracked differs from data that is provided by the City of Detroit through its open data portal. There are certain types of fires we did not track, including vehicle and garage fires unless they damaged a primary structure. How Loveland determines fire cause is from the disposition code, which may change after investigation. As the fire events are added to the spreadsheet, a surveyor is dispatched to the scene of the fire to verify all details and assess the level of damage. The surveyor photographs the fire, talks with neighbors and property owners, and takes notes on all details of the fire that may be of value. This information is collected and sent back to Site Control using the Loveland surveyor app, where it is checked as part of the quality control process. The reviewer then makes a final determination about the level of damage caused by the fire and checks all of the details. Date, Time: All audio files collected from the scanner are time stamped. The time is the actual time of dispatch. Orientation: This field gives details about where the fire was located, which are usually filled in later. EXT is short of extension fire, or a fire spreading from next door. ADD is for additional fires that happen in the same structure in the same month. 2ND denotes a second alarm fire. Street name, zip code: Geographic information. PID: Parcel ID. This is the tax assessor ID number for the property, which is how we track exact locations. Building type: This gives details about what type of building it is, including apartments, single-family dwelling, multi-unit dwellings, commercial buildings, and other specific types. Occupancy: Occupied, Vacant, Partial Occupancy, Unknown. This is first the stated occupancy of the structure as given by the fire department at the time of the fire. When the property is surveyed, additional information from neighbors or other sources is factored into determining occupancy. If it is unclear if the property was occupied or not at the time of the fire, we use unknown. Alarm: The number of alarms called for the fire. Mainly for large, out of control fires that require additional companies. We track multiple alarms as fire events so we can note the additional companies being sent. Damage: Fire damage falls into four different categories. Minor fire damage is mostly cosmetic in nature, but still requires repairs. This includes smoke / soot damage, light scorching, and water damage. Houses with minor damage are usually inhabitable after the fire. Moderate fire damage is significant enough to require immediate repairs, and may temporarily render a house uninhabitable. Major fire damage is severe enough that it would be costly to repair the structure and makes it uninhabitable. Severe charring inside and outside the building, with damage to contents. Small holes in the roof caused by fire or by cut by firefighters to ventilate the structure. Collapsed fire damage causes partial or total structural collapse of the roof or walls. This includes buildings that have burned down to the foundation. Walls may still be standing, but parts or all of the roof have caved in. We use disposition codes to determine if a fire was deliberately set. Disposition 011 Incendiary means that evidence of arson was found at the scene. 021 Suspicious means that the fire appears to have been deliberately set. We combine these two numbers to determine a hypothetical suspicious / arson rate. There are some shortcomings with this method, as it is a judgment call made by fire personnel at the scene based on the information they have at the time. Some fires reported as 000 Unknown / Undetermined are later confirmed to be suspicious by field surveyors talking to neighbors. Apparatus designations, including C, E1, E2, E3, E4, L1, L2, S: These are short for battalion chief, first engine called, second engine, third engine, fourth engine, first ladder called, second ladder, and rescue squad. The standard response for a fire is to dispatch a battalion chief, two engine trucks, a ladder truck, and a rescue squad. Depending on the severity of the fire, some companies may be called off before they arrive, or additional companies may be requested. The numbers in the spreadsheet correspond to the company number; C1 is battalion chief 1, E1 is engine company 1, L8 is ladder company 8, and so on. With the introduction of mutual aid agreements with the cities of Highland Park and Hamtramck, their fire companies now respond to Detroit fires and vice versa. Highland Park fire companies are denoted as HP1, while Hamtramck companies are HM1. Extra: When additional companies are requested above and beyond four engines or two ladder trucks, they are noted in this column. Special units, including senior chiefs, hazardous material, or fire marshal units are noted in this column. Arson: Denotes if the arson squad is requested. IEH: Illegal electrical hookups, or people stealing electricity. This can be a contributing factor to occupied residential fires. BH: Bad hydrants. Some of the city’s fire hydrants are old and no longer work properly. This causes delays in responding to fires, as fire engines carry only carry a limited amount of water in their onboard tanks, and require hydrants to provide water. Verified: The fire location has been visited by a surveyor, and the data submitted has been checked for accuracy. Notes: Reviewers and surveyors compile lengthy notes about the fire based on what can be heard on the digital scanner and what they learn in the field. Some of these notes have been edited to remove sensitive information or personally identifying details. *Where noted, data was provided by the Detroit Fire Department independently of Loveland research efforts.